Bleh! 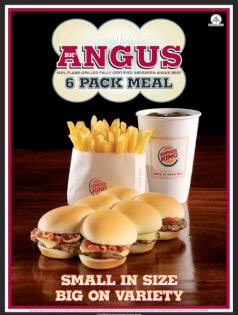 BK UK has just come out with a “six-pack” Angus burger that porks packs a whopping 917 calories. Two of the rolls have ketchup inside; two have cheese, and the remaining two have cheese AND bacon inside. Yowsa! That’s a heart attack waiting to happen! Shaped like six mini burgers, this monstrosity is supposed to encourage social eating because it’s designed to “tear and share” among family and friends. Interesting, though, that it’s being sold with only one serving of fries and one beverage?? I’m not buying that argument, and I would never buy that burger either. Yuck! Entry filed under: food review, news around the blogosphere. Tags: fast food folly.